Bali is a small island, but it has more than a few active volcanoes. These rugged mountains are beautiful to see, but you can also climb them – good news for all outdoor lovers! The tallest and holiest volcano is Mount Agung and a hike up this baby is certainly not easy. In fact, it is quite a challenge but super rewarding! Another popular trek is up to the summit of Mount Batur, which is a bit easier than its big brother Mount Agung. These Sunrise Trekkings make true island adventures where you will be leaving from your starting point in the middle of the night and climb to the top to catch the jaw-droppingly beautiful island sunrise to blow your mind away. Get your best hiking shoes on and off you go to get your eyes on the most amazing bird-eye views of Bali. Also, read 8 rules to surviving a climb up Mount Agung. However, Mount Agung is active at the moment, so it’s not possible for you to attempt at this holy mountain. For more information about the eruption, check out here. Those who love water and adventure, Bali has got some great activities you shouldn’t miss out on during your stay. The crystal clear rivers rushing through the valleys of central Bali make awesome spots to go white water rafting, canyoning and even canyon tubing. The surroundings are raw and unspoiled, and the activities range from fun to challenging. A must! Those who have been to Bali and haven’t tried surfing really miss out on something essential to this beautiful paradise island. It is a surfer’s haven no one ever gets enough of. Beginners and pro’s, Bali is awesome! 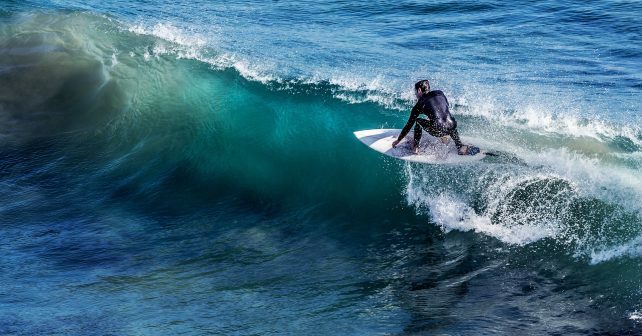 So, for all of your active travellers out there, surfing should be on your top list of things to do! Take a surfing lesson or just rent a board and paddle towards to waves to go for a ride. At the end of all the hard work, you’ll be rewarded with the stunning island sunset and some ice cold beers or tropical cocktails. Nothing beats this! Beginners should try surfing in Kuta, Seminyak or Canggu. Experienced surfers will love Uluwatu and Nusa Lembongan. The world beneath the surface of Bali is just as beautiful as it is above. Home to coral gardens and tons of exotic fish, it is an underwater paradise. All along the coastline, there are little fishermen’s villages where you can rent a private villa, stroll to the beach with your snorkelling set and explore the colourful marine life. There are also many snorkelling trips available and tons diving schools where you can get your PADI or go for a scuba dive. Be sure to check out Menjangan Island in West Bali and Amed in East Bali. You will love it! Surrounded by rice terraces, villages and more of the raw, untouched natural beautiful surroundings that Bali has to offer, your eyes won’t know where to look to take in all this beauty during a cycling tour or an ATV Ride. This is the best way to see the authentic ‘real Bali’. A downhill ride with the wind in your hair is the most memorable way to enjoy the view!